The Biggest Concerns About GMO Food Aren’t Really About GMOs. I’ll take the science over the hype any day. Are there pro’s and con’s? Of course, as with any issue. Meanwhile, two quotes simplify the matter rather well. 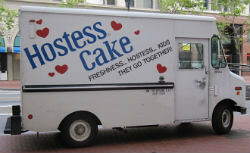 It’s all sweetness and light (creamy filling) until Hostess closes the doors. Or is it?